This blog post is in collaboration with the lovely Chloe from A Girl's View. Make sure you go and check out her blog and her Spring suggestions! 1. 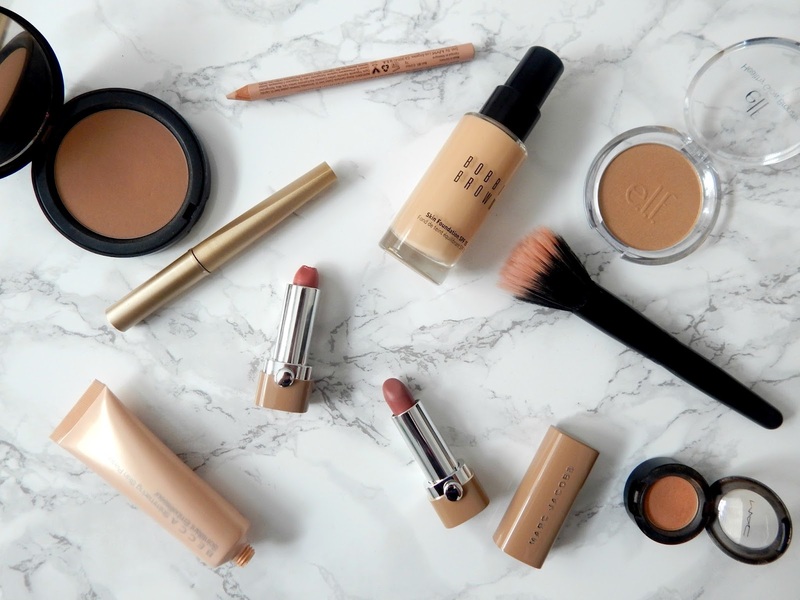 Heavy Foundations/Concealers: If you aren't all about that glow all year round then at least adopt it in Spring. It makes you look so youthful and alive. Opt more for a BB Cream, a tinted moisturizer, or a light coverage foundation. Apply it with a stippling brush for an even more sheer application. 2. Eyeliner: Who else gasped at me even mentioning this? I know, I know. I am a daily jet black eyeliner girl and I don't quite feel like myself when I don't wear it. So I have two options here for you. You can either go sans eyeliner and really focus on your lashes or you can switch it out for a brown eyeliner. Marc Jacobs Magic Marc'er in Cocoa Lacquer is wonderful (full review coming soon). You can also go for more copper or burnt tones with a pencil liner as well. Still feel like your eyes won't pop if you don't use liner? Then line your inner rims with Tarte's Inner Rim Brightener. It will instantly make you look more awake and alive. 3. Dark Lipstick: Notice I said "dark" and note "red" lipstick as we all know I believe red lipstick is appropriate year round. But it is at this point that I ditch all my dark berry tones and move on to more nudes and glosses. I especially love all of the shades from Marc Jacobs New Nudes collection. You simply can't go wrong with them. 4. Silver/Dark Eyeshadow: I don't naturally gravitate towards these colors to begin with but for my everyday Spring look there is no other for me that M.A.C. Arena. It is like 'your eyelids but better' if that were actually a thing (is it?). It is about a shade or two darker than my eyelids and just brings in a bit of dimension and evens out my skin color. 5. Harsh Contour: I often like to forgo contouring all together and just use a light bronzer on my cheeks, temples, and forehead. My favorite is Bobbi Brown Bronzing Powder in Golden Light. And if you want to amp up that glow then apply e.l.f. Sunkissed Glow Bronzer instead. At $2 you really can't beat it. It has a fine milled sparkle to it that catches the light and gives you that glowing from within look. Don't forget to stop by A Girl's View for more fun Spring ideas! I love all of your spring suggestions! Especially the eye liner tip! It was great working with you too! Can't wait to try out some of your suggestions. These are some great suggestions.I love your bb cream suggestion which is great for spring when you don't want too much make up on. Exactly! Pluss BB Creams have great SPF options too. Yes! I can't wait to switch over to BB creams. I just pulled out my bright pink and coral lipsticks this weekend. I will be getting all my pinks ready too! I need to start getting in the habit again of wearing makeup. It's been too long. Also, if that's your bathroom counter I have to say that I'm jealous. It's beautiful!